It’s time for the second gear guide of the season, to help you work on your gift list. Last week, I started with sharing my running gear guide – with everything you need for running. I know not all of you are runners, so it’s time to move on to the gear guide for those of us who are interested in other areas of fitness. 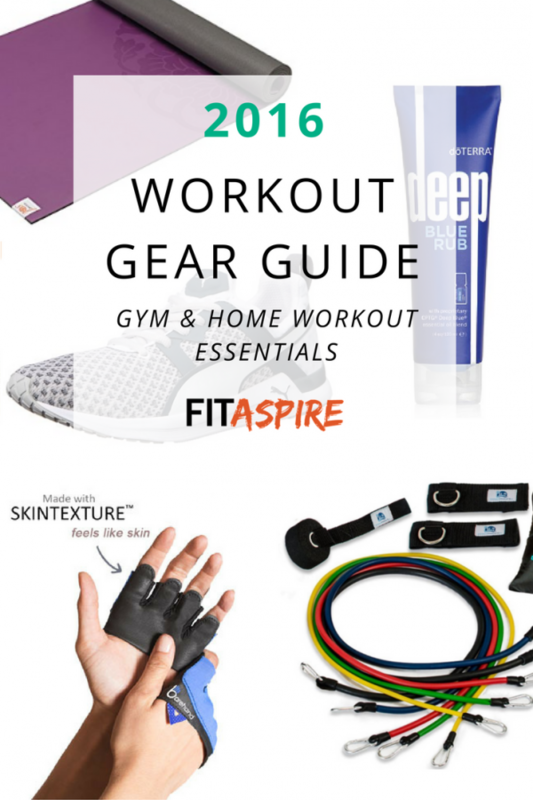 It’s time for the workout gear guide – for both gym and home workout fans! I have been a fan of Fabletics capris for almost two years now. I look for workout clothes that look good, fit well, and are reasonably priced. These cover all those point for me! I have purchased several of these workout tanks over the past few years and still wear them regularly. It’s nice to have tank that is comfortable and also shares a message of my faith. If you’re a believer, I highly recommend these. Another brand I have worn for years in the gym. They are lightweight, slip on easily, and look pretty good! I have worn bulkier weight lifting gloves before, but I prefer these lightweight version by far. You can still feel the weight, but it helps prevent slipping and callouses. A great balance for me. You can never have too many shaker bottles. Great for mixing up your bcaas & creatine before heading tot he gym. Or for mixing up protein shakes on the go – we even took some on vacation! I purchased two of these yoga mats – one for home and one to take to the studio. If you are used to slipping around on the normal textured mats, you’ll love how secure you feel on this dry-grip mat. It’s a huge difference in my practice. If you enjoy home workouts, this is a key piece of equipment to give you more options with your exercise options. There are so many ways you can use this in your workouts, from core strength to hamstring strength. Or you can use it as a chair substitute for laptop work. When you don’t have dumbbells, resistance bands are a great alternative to building and maintaining strength. You can use them for this resistance band workout, which you can do at home or pack your bands in your suitcase for travel. I’ve had my eye on adjustable dumbbells for a while now, but we are less than mile from our gym and haven’t made the investment. If you prefer to workout at home, I would absolutely recommend a set like this to make workouts even more effective! I’ve tried at least 6 pairs of headphones in the past few years, but I always go back to these wireless headphones from SOL REPUBLIC. They are easy to charge, comfortable, and have great sound quality. As I mentioned in the running gear guide, Kirk & I both wear the Garmin Vivoactive every day as our watch, step tracker, and sleep tracker. It also connects to my smartphone and notifies me of emails, texts, facebook messages, etc. These are smartwatches for athletes, in my opinion. I’ve been using this protein powder for almost 2 years now and I’m still loving it. The Fruit D Loop tastes just like the milk leftover in Fruit Loops. Seriously. And yes, it has sugar, but they also just launched a natural protein, which I am excited to try next! Although I don’t know if I can give up the Fruit D Loop. If you are lifting weights, you should be taking BCAAs. Look for a supplement that contains leucine, isoleucine, and valine to get the most benefits. I’ve tried several different brands and keep coming back to 1st Phorm. Creatine is one of the most studied supplements and has consistently been shown to stimulate muscle protein synthesis, increase power and strength to improve muscle mass. I mix mine with BCAAs before heading to the gym and sip the mix throughout my workout. Before a tough workouts, it can be helpful to have an extra kick. I’ve backed away from pre-workout mixes, but this is a stimulant-free, natural alternative. I have been enjoying this before workouts for energy & focus without the jitters. If I could rename this metabolic line of essential oil supplements, I would. But this is great for anyone who wants a little support for their fat loss goals without resorting to stimulant, diuretics, and other not-so-good synthetic approaches. This blend of natural plant-based oils works with your body to reduce sugar cravings and otherwise help you with your goals! If your goal is fat loss, strength training should be at the core of your training plan for best results. You can download a 2-week training program for FREE, or the full 6-week training program is just $9.99 (for a limited time). When I work out on my own, I use an app like JEFIT to help plan & track my workouts. When I coach clients, we use Trainerize for that same purpose. Remember that tracking your workouts is a great way to measure progress and keep moving forward toward your goals! I originally purchased these before our last vacation, so I could leave my makeup remover wipes at home. After using this during the trip, I decided this is my makeup remover of choice – it’s just so easy. Great to throw in your gym bag to remove mascara and other makeup before your workout. Do you prefer home or gym workouts? What is at the top of your wish list?